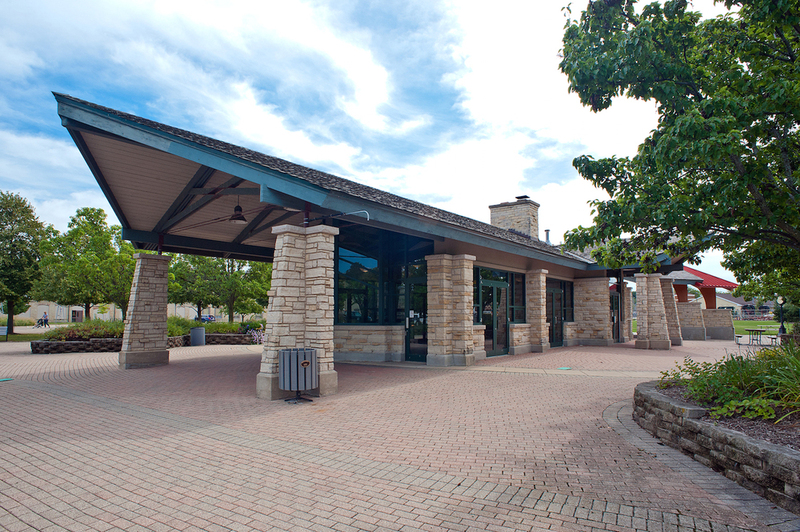 The Peg Bond Center is built on property owned by the City of Batavia and managed by the park district. The project came to fruition with the volunteer efforts of thousands who raised funds and donated services. This required us to satisfy several different entities as well as meet the approval of the Historic Preservation Commission, since the property rests along Batavia’s historic Riverwalk and lagoon. 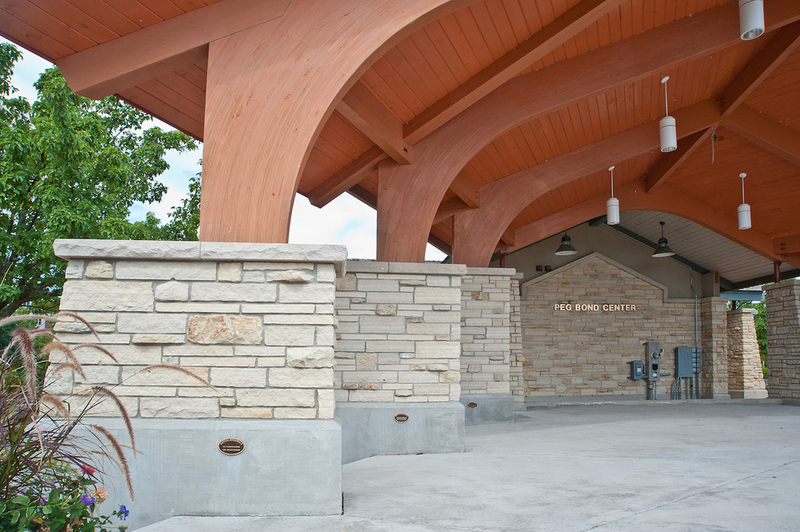 We built the original Peg Bond Center to include a small concession stand, an indoor event rental space, an outdoor gathering place and canoe rentals. 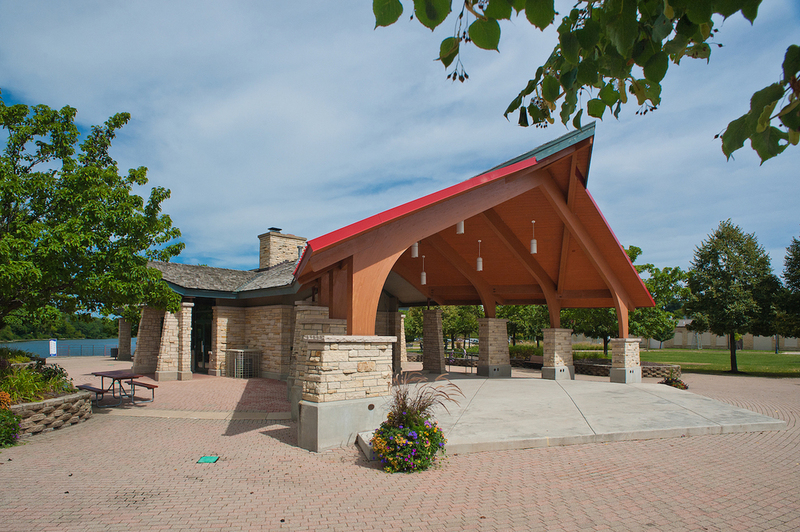 As the project became more successful, the Riverwalk committee asked us to create a larger band shell to accommodate concerts and performances. We were able to meet this challenge by integrating a new timber band shell structure with the existing building through prow-shaped overhangs to create larger cantilevers, and dropped down triangular shapes to vary the elevation. By including the red, standing-seam roof element that contrasts with the aqua trim along the cedar shake roof we've enhanced the structure’s distinct look. Working with an acoustical engineer, we created a design that projects sound. Stone piers that step down in size as they spread forward makes the band shell appear larger. The structure’s prow shape creates a nautical form and complements the riverside location. 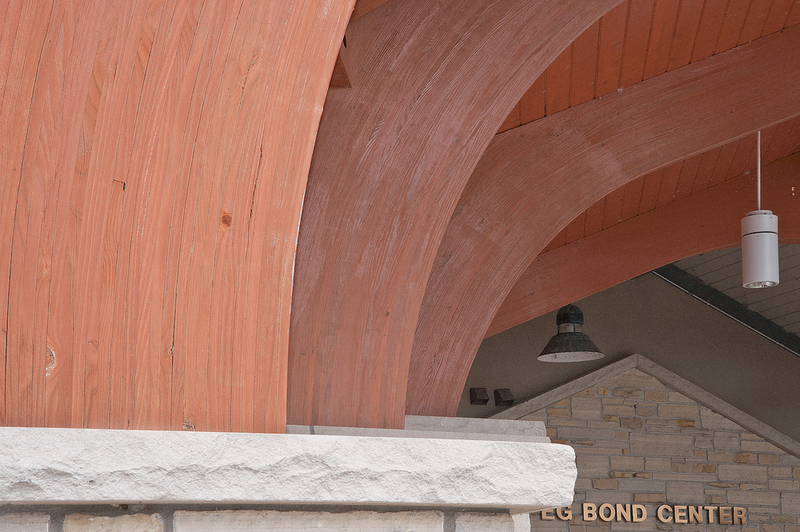 Today the Peg Bond Center is the vibrant heart of scores of community social events. Steve worked through our budget challenges with us and completely satisfied our needs. Steve’s ability to work with a committee of volunteers, especially with the reduction of space and funds, was tremendous. Talk to Vasilion Architects about realizing your home design vision. We keep it simple. Give us your dreams, and we'll deliver their design.